I know you’re looking forward to a nursery post, so you may be happy to hear that this is somewhat related. G and I have always planned for the smallest bedroom (a.k.a the “4th bedroom“) across the hall from our master to one day be the nursery. Until that time we were using it as an office/guest room and it housed our computer and a futon we bought years ago when we first moved in together. Well there was no way either of those things would be staying in there once we converted the room to the nursery, so I made plans to move the computer to the “Circle Room” bedroom and suggested to G that we sell the futon since we already had plenty of other guest space. SELL THE FUTON? ARE YOU KIDDING ME?? That was pretty much G’s reaction to that idea. I had no idea the man was so attached to that thing! G has always let me do pretty much whatever I want when it comes to our home, but when he does actually object to something I (try to) listen. He DID NOT want to sell the futon, and he wanted it to remain in the nursery for extra seating. I disagreed with both of those ideas, but most strongly with his desire to keep the futon in the nursery because I knew there was no way we’d be able to fit it, a crib, and a dresser into the smallest room in our house. I suggested finding another spot in the house for the futon, that way we didn’t have to get rid of it and it wouldn’t be taking up half of the baby’s room. 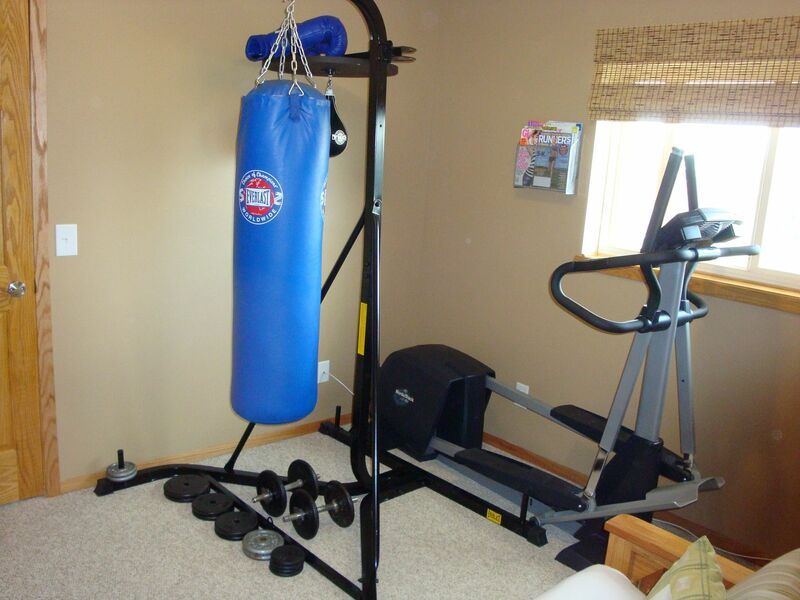 I suggested moving it to the 5th bedroom in our lower level which we use as a workout room. G was open to that idea, but didn’t think it would fit with the other things we already had in there. Challenge time! Was it possible to fit the elliptical machine, G’s heavy bag, a TV, and the futon in our workout room? Only one way to find out! 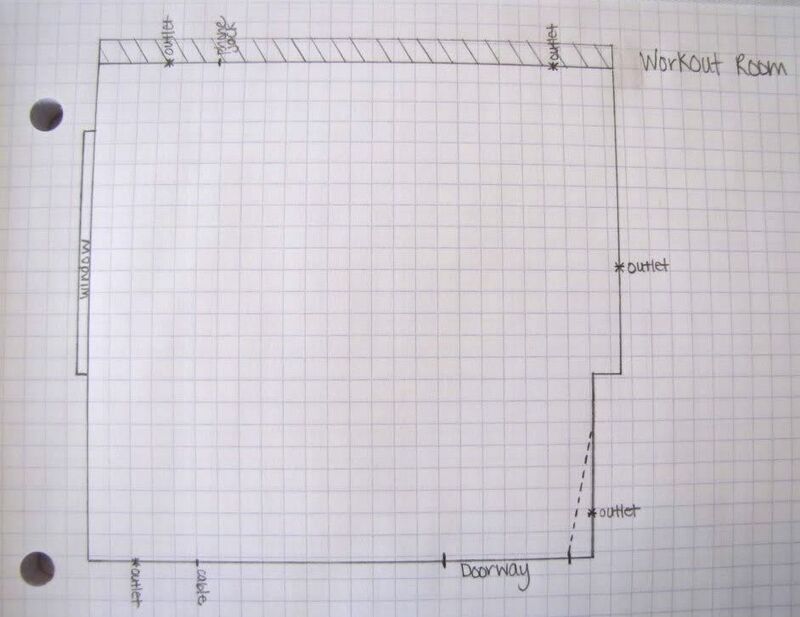 Then I graphed out the entire room to scale (click to enlarge), using the instructions I previously wrote about in this post: Get To Know Graph Paper. With the prep work out of the way, it was time to see if everything could fit or if something (*cough*the futon*cough*) had to go. It was a bit of a tight fit with everything, but luckily it’s the frame of G’s heavy bag which takes up so much surface area–not the body–so that is easy to walk around and work around. Time to put my plan into action! I can’t believe I don’t have a more recent “before” picture, but here is what the room looked like when we first moved in. 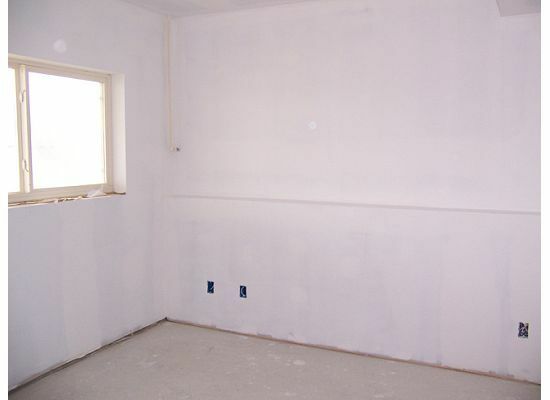 It was only partially finished, so G finished the electrical work, together we texturized the drywall and painted it a basic off-white color which we used for the entire lower level (the Man Room and the 4th bathroom), and we had Home Depot install the carpet. I repainted the room the same color as our 4th bedroom upstairs–where this futon was previously located–because I really liked the color (and would be repainting over it to make that room the nursery) and already knew it went well with these pillows. The cabinet in the corner is a hand-me-down armoire that we got from G’s boss. It holds a VCR and TiVo inside, and does a great job of keeping additional free weights, resistance bands, sweat towels, and other workout accessories organized and out of sight. The elliptical faces the TV (of course) and I hung a wall file holder to keep my magazines close at hand. It’s difficult to get a good picture of the entire room, but the space between the futon and the doorway is all open so G has plenty of room for boxing. There’s also an ab ball and some resistance balls that roll around the space and get tucked into a corner when needed. In the end we were both pretty happy with the results. G got to keep the futon and I got it out of the baby’s room–our compromise was a success! What is it with men and their silly obsessions? My husband wants to keep a leather sofa that i so want to ditch and replace with a sectional. We just don’t have a place to put it, so we would like to keep it! I’m glad you figured out what to do and it looks really nice too. You’re a great wife to notice when something is special to him and compromise. You guys will have your happily ever after! And your baby girl will have an example of how to be a loving wife and treat her dad with respect. I’m glad you kept the futon. Its cute! Especially with the bright pillows. 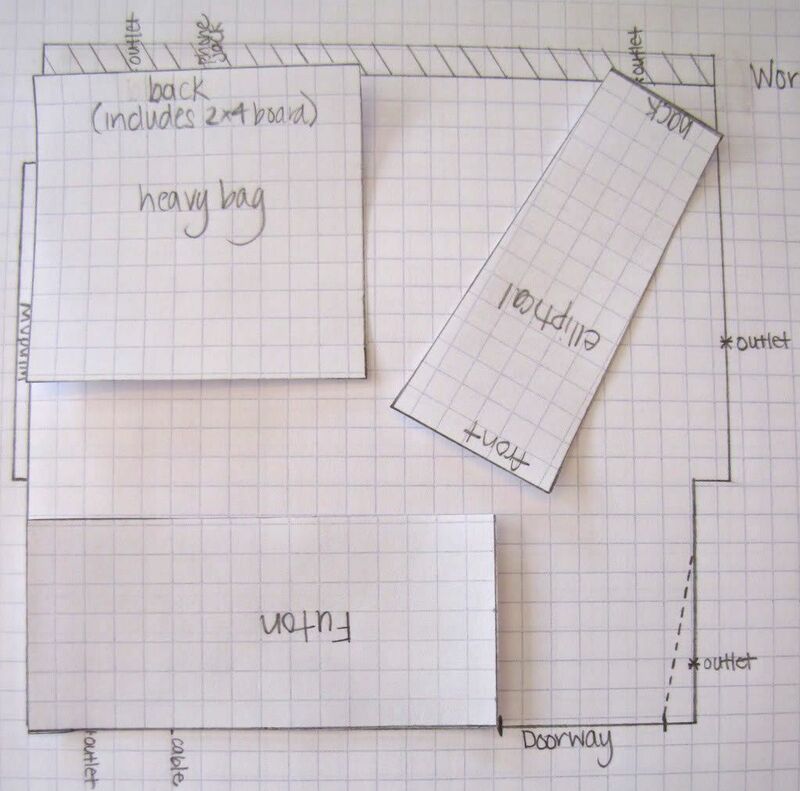 Love your planning! 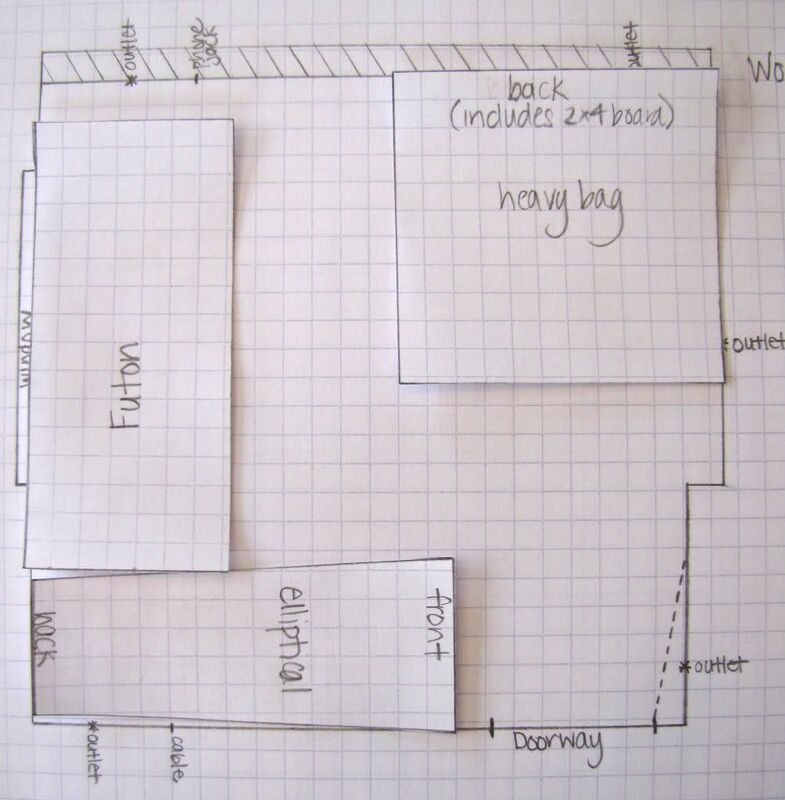 My initial reaction was “that’s a lot of work”, but it has to be so much easier to draw it up and move papers around than drag a futon into and around the basement. Wonderful post! You have 5 bedrooms and 4 bathrooms! Holy cow! Love the compromise. 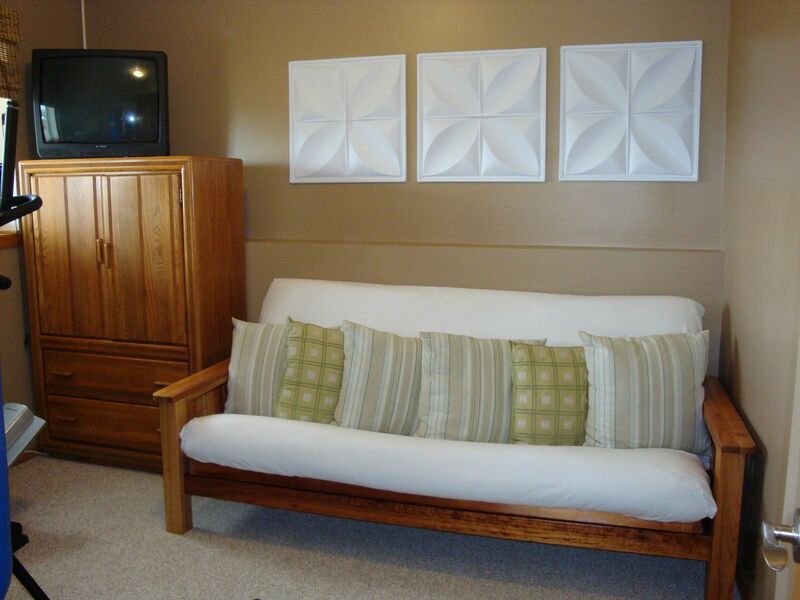 Question – where did you get the 3 pieces hung above the futon. are those ceiling tiles? @Rebecca–I think a lot of men are attached to their sofas/chairs, etc. I have a few friends that have been (or are) in that situation too. Good luck! @Sarah–Thanks for you wonderfully sweet comment, but I have to admit you’re giving me more credit than I deserve. I confess that I gave poor G a run for his money before I finally realized he wasn’t going to give in to me. I even tried to give away the futon to my sister–eek! He wasn’t happy about that one. That’s when I (finally!) realized I needed to do a better job of listening to the poor guy and figure out a compromise that would work for both of us. Lesson learned! @Angela–Yep, we do. Sounds nice in theory, but not when it comes to cleaning. Ugh. @Suzanne–Those are “free sample” plastic ceiling tiles from Empire West (www.empirewest.com). 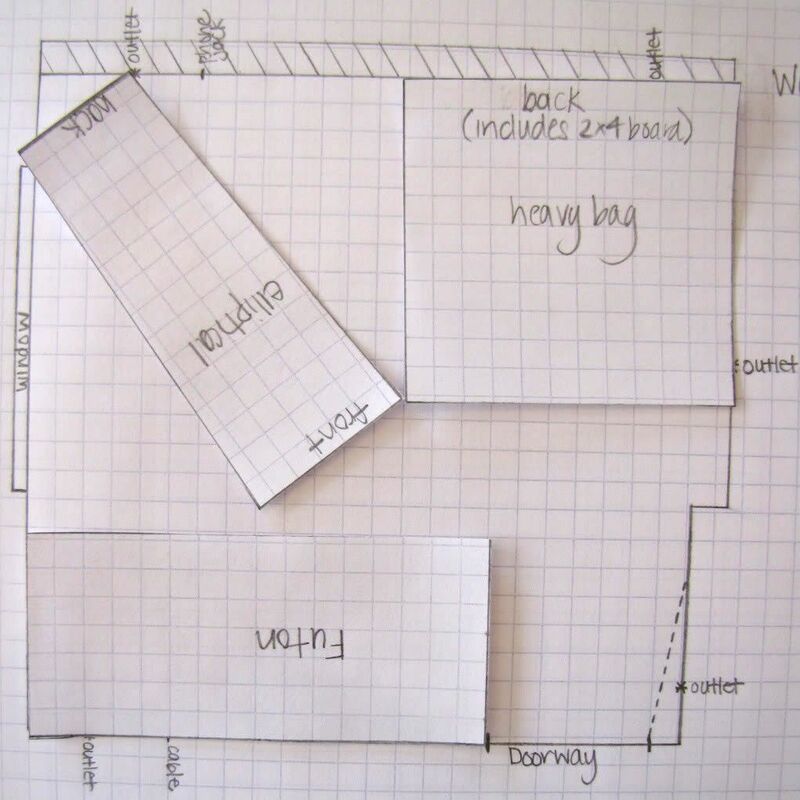 Can’t wait to see nursery ideas and pictures! Hey D! Great work! 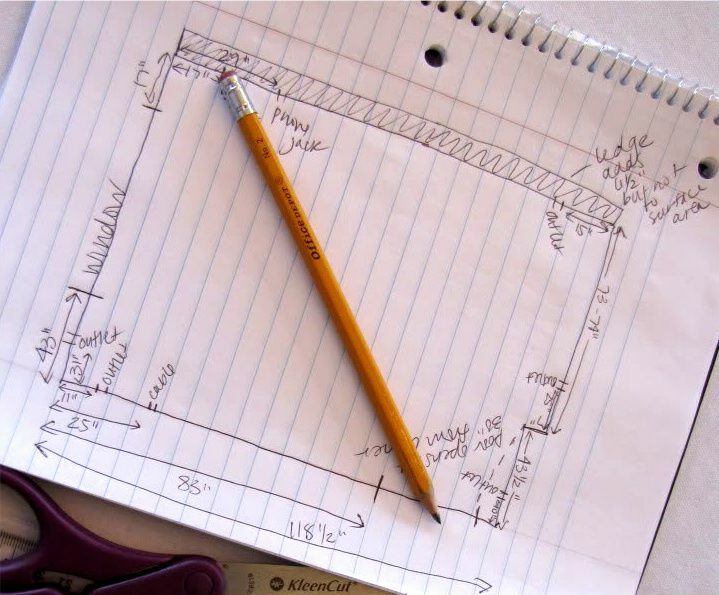 I may need your graphing assistance someday! I adore those ‘free samples’ above the futon, too! Getting excited for New Moon?!?! The new arrangement looks great! I have to admit, I’m not a fan of futons, but that probably the nicest foton I’ve seen. So, I think G had a (small) point in keeping it. I also love the paint color and pillow coordination. PS. I too am jealous of your 5 bedrooms! 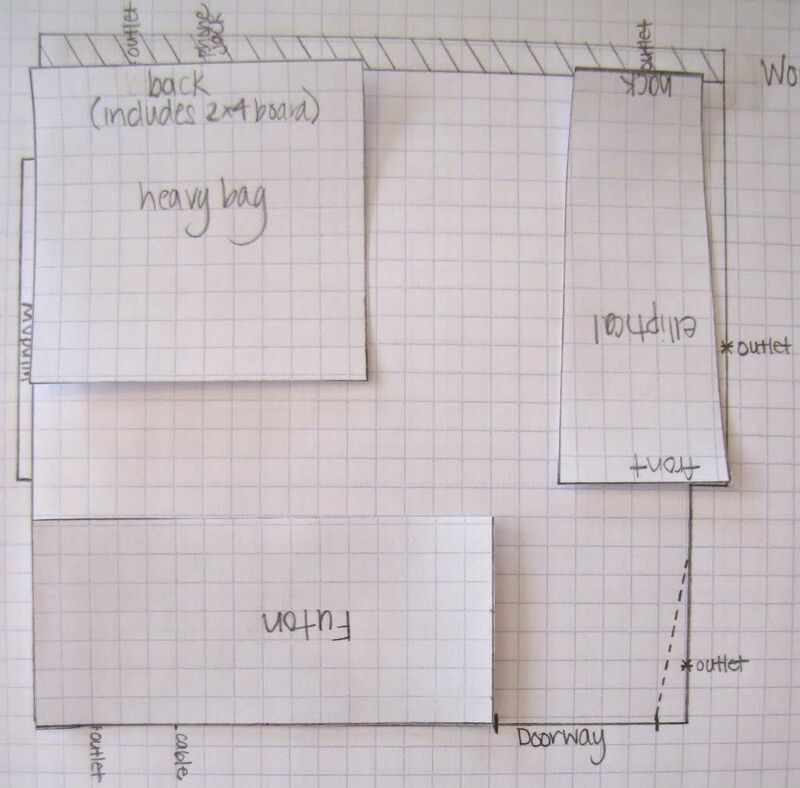 I love how you draw things to scale and cut the objects out so they are movable. So smart! I think it fits perfectly in the workout room – now you can watch each other workout! I second that what is it with men and their attatchments? I am currently headboardless because JEGs insisted we bring his bed and not mine when we moved in together. Room looks great though, D.
Boys and their couches! Wife of the year award goes to you! Looks super good, I love that color down there too! ::whipping head around in disbelief:: Why do the men-folk LOVE their man-beds?! I had to design our office around the damn thing too. I love how everything just fit like a puzzle, D! Looks fab! Great compromise. 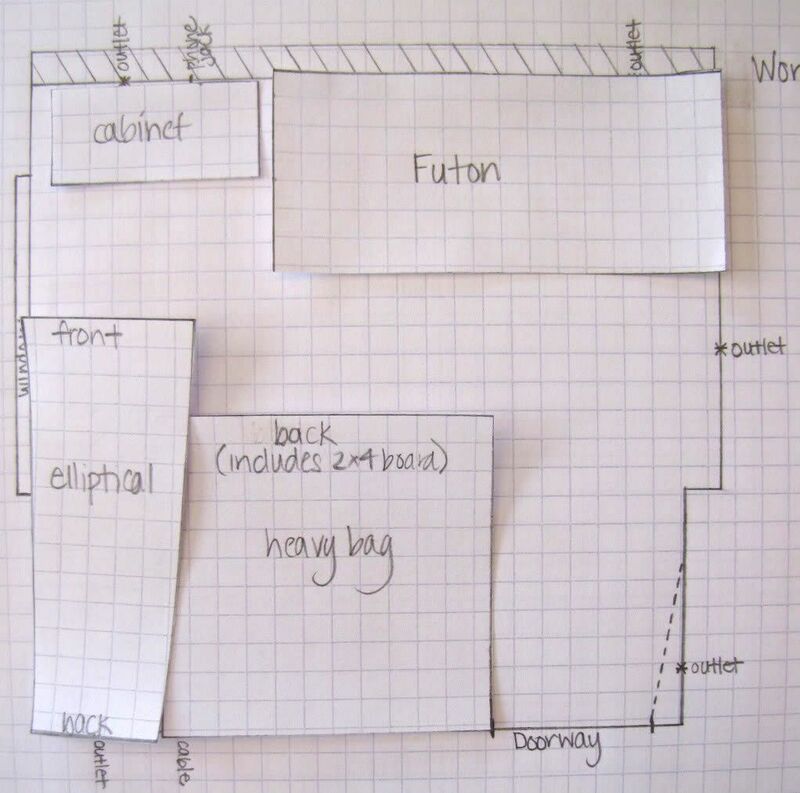 I love the use of graph paper and little cutouts. I do that to! Can’t wait to see what you’ve done in the nursery so far. I hope to post updated nursery pictures soon too. @Staci M.W.–OMG, YES! I am SO EXCITED for New Moon to come out–I can’t wait! @SweDaisy–Looking forward to seeing your nursery pics! @Lindsay–No, I ordered 3 of the same color. I just noticed they limit you to one free sample/tile on their site now, but that restriction wasn’t in place when I orderd mine. I had 3 other petal tiles that I had previously ordered which I painted a dark brown/bronze color (and gave to a friend) so I can tell you that they’re easy to paint if that helps at all! Thanks! Lol… Sorry to sound obsessive!